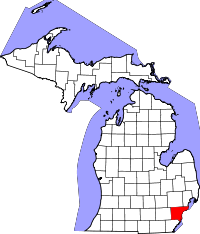 Wayne County is a county in the U.S. state of Michigan. As of the 2010 census, 1,820,584 people lived there. It is the 18th most-populous county in the United States. The county seat is Detroit which is the largest city in Michigan. Wayne County was one of the first counties formed when the Northwest Territory was created. It was named for the American general "Mad Anthony" Wayne. When it was created, the entire area of the Lower Peninsula of Michigan and small sections that are now part of northern Ohio, Indiana and Illinois were part of Wayne County. On August 15, 1796, the boundaries of Wayne County were set to begin at the mouth of the Cuyahoga River then west to Fort Wayne, then to the southernmost point of Lake Michigan and along the western shore north to the territorial boundary in Lake Superior and then along the territorial boundary through Lake Huron, Lake St. Clair, and Lake Erie back to the starting point. On January 14, 1803, the Governor of Indiana Territory, William Henry Harrison, changed the boundary. This new boundary included Chicago, Illinois and a large strip of Wisconsin along Lake Michigan. These boundaries were later changed again when Indiana and Illinois became states and as other counties were created in Michigan Territory. The county has a total area of 672.20 square miles (1,741.0 km2). Of this, 614.15 square miles (1,590.6 km2) (or 91.36%) is land and 58.05 square miles (150.3 km2) (or 8.64%) is water Parts of the Detroit River and Lake St. Clair are included in the county. The eastern boundary is a water boundary in the Detroit River and Lake St. Clair with Essex County, Ontario, Canada. Cars crosses this boundary at the Detroit-Windsor Tunnel and the Ambassador Bridge. Grosse Ile is the largest island in Wayne County. It is connected to the mainland by the Wayne County Bridge and the Grosse Ile Toll Bridge. The white areas represent unincorporated charter and civil townships. The gray areas represent incorporated cities and villages. ↑ 1.0 1.1 "Bibliography on Wayne County". Clarke Historical Library, Central Michigan University. Retrieved January 23, 2013. ↑ "U.S. Decennial Census". Census.gov. Retrieved March 17, 2013. ↑ "Annual Estimates of the Resident Population: April 1, 2010 to July 1, 2012". Retrieved March 17, 2013. "Bibliography on Wayne County". Clarke Historical Library, Central Michigan University. Retrieved January 23, 2013. This page was last changed on 20 November 2018, at 11:10.